Discrimination is dead! Long live discrimination! I’m sure many people feel this way in terms of age discrimination during the hiring process. We all know people are both living and therefore working longer – 50 is the new 30 right? I was a child of the 70’s with grandparents in their late-forties at the time and back in the day they seemed …dare I say it…pretty old! However, today this is no longer the case. I’m 43 and I know what’s in the music charts, I know the latest number one and I love & appreciate the same music people of a younger age do, as well as the stuff I was brought up on. We’re not all over-the-hill and useless from the age of 50, just look at Madonna! I read an article recently In the Recruiting Times Ros Altmann is calling for the recruitment industry (both in-house and external recruiters) to stop discriminating against older workers and to “realise the potential of older workers”. 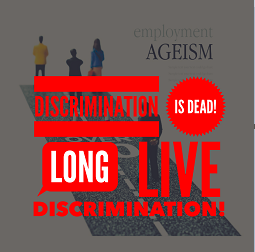 I couldn’t agree more that older workers have huge amounts to offer and shouldn’t face discrimination. Research shows if the 1.2 million workless over 50s who want a job were supported into work, it could add £50 billion to the economy as part of the government’s long-term economic plan. However, I don’t believe the discrimination problem lies solely within the recruitment industry. As a recruiting firm we do not discriminate, it’s not in our interest to do so bearing in mind the way most of us are remunerated for the work we do i.e. on a contingency basis. Put simply, we put forward candidates who have the right experience/skill-set for the role regardless of age. Nowadays, dates of birth no longer need to be shown on CVs, however it’s not too hard to guess someone’s age from their work history. We don’t decide who the hiring company actually selects for interview, we present candidates we believe the company should see yet ultimately they make the decision. We still hear, now and again, when taking a brief ‘we’re a young company’ or it’s a ‘young team’ or ‘more experienced candidates may find some of the tasks a little mundane’ and we have to stand firm and say we will present people who we think have the right experience regardless of age.